Don't let the prospect of hosting a Halloween party make your skin crawl! 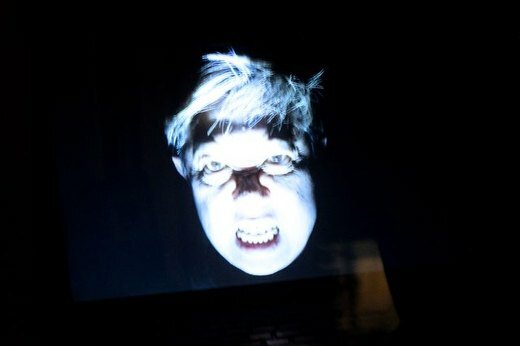 Unleash your inner goblin this year and treat your fellow ghouls to a bash so electrifying that they'll talk about it in the afterlife. What's our not-so-scary secret to an epic monster mash? Simple: eye-catching details. You'll be surprised by how much drama you can achieve when you focus on a few projects that boost imagination without inflating your budget. Stick to the most popular spaces in your home, like the entryway and kitchen, and group your decorations together to make a lasting impact. 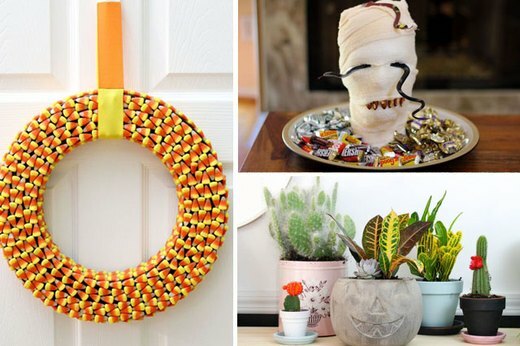 Here are a few spooktacular ideas to get you started. 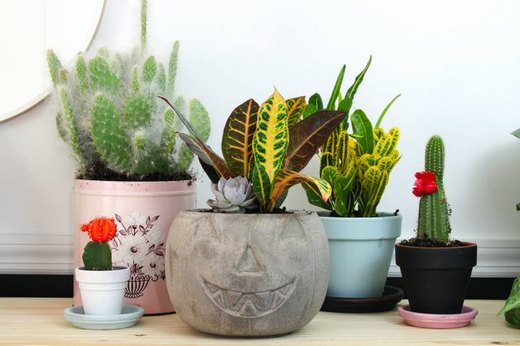 While actual carved pumpkins will only last for a few days on your front porch, these concrete planters will be standing strong for the entire month of October. Use an inexpensive plastic pumpkin as your mold and you'll have a perfect planter every time. Deck out your front door with a festive wreath so your friends know exactly where the party is. 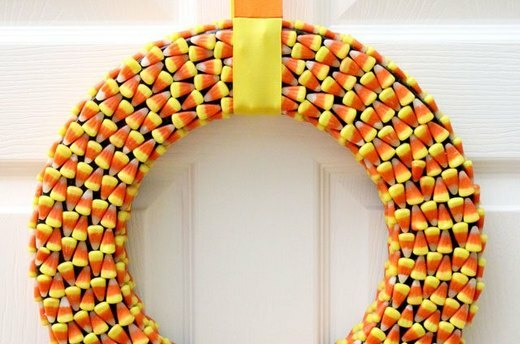 Wrap a simple foam wreath in black tape and use hot glue to secure the rows of candy corn. Cover the candy with a protective spray before attaching the sweets so you can use the wreath again next year. Turn yourself into a bone-chilling floating ghost and you'll impress everyone who walks in the door. This scream-worthy decoration is something that packs a punch, but it doesn't take a ton of work to put together. Set it up in a doorway or your front window to make sure it's seen by all. 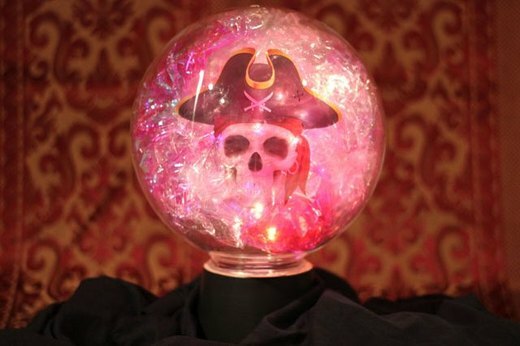 Simple supplies, like cellophane and a strand of fairy lights, make for one spooky crystal ball decoration that your guests will gaze at all night. Print your ghostly image on transparency film and position it among the layers of cellophane — it'll look like it's floating in the middle of the jar. Now just dim the lights and let the haunting begin. Don't let the opportunity for a clever trick pass you by! 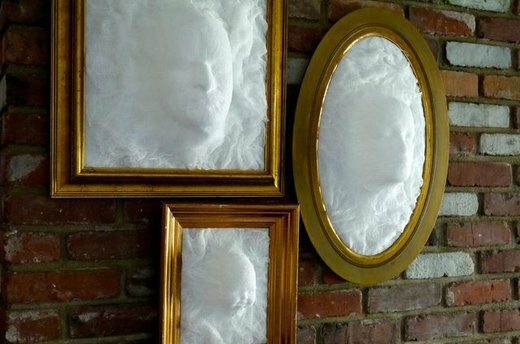 Line a dark hallway with these terrifying picture frames and watch your unsuspecting guests freak out as they search for the bathroom. 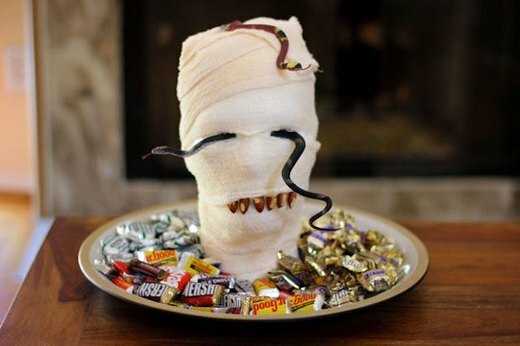 Make sure there's always someone guarding the candy even when you're not there. This platter is more playfully scary than downright horrifying, which means it's a great decoration for ghouls of all ages. Go ahead and empty your whole candy bag — no one will be brave enough to sneak more than one piece! 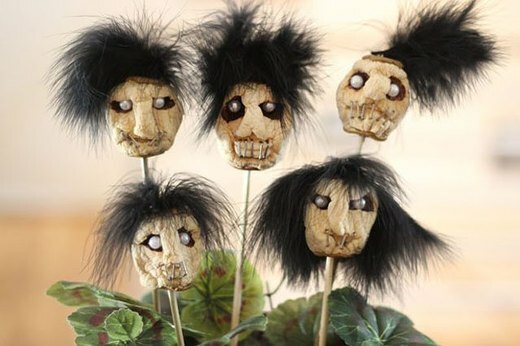 Throw a little pre-Halloween party and invite a few besties over to help you make these horrifying shrunken heads from a batch of peeled apples. Let them dry out in the oven for a full 24 hours, and then add embellishments. These would look extra creepy on the buffet table. Sometimes it's the little details that make the biggest difference when it comes to holiday decor. 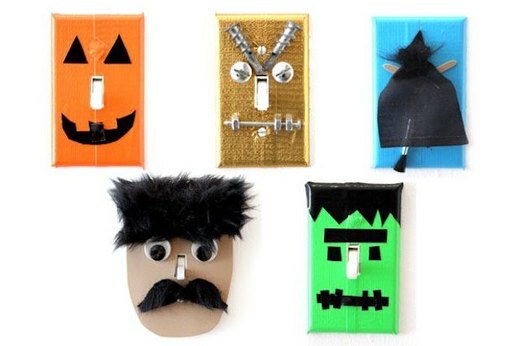 Let your light switch plates get in on the theme by outfitting them in "costumes." From a frightening Frankenstein to a crashing witch, your light switches never looked so scary. Line your counters with bottles straight from a witch's kitchen. Take an empty pill bottle and write out a potion's name in hot glue before giving the entire thing a few coats of paint. Add twine and Spanish moss around the top to complete the look. 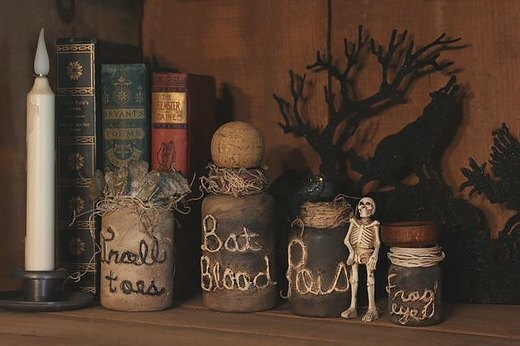 When the party's over, pack them away carefully so you can use them to cast a spell on your guests next year. You can't host a Halloween party without a cool costume. If you don't feel like wearing a mask or a head-to-toe getup, a little face paint can go a long way. 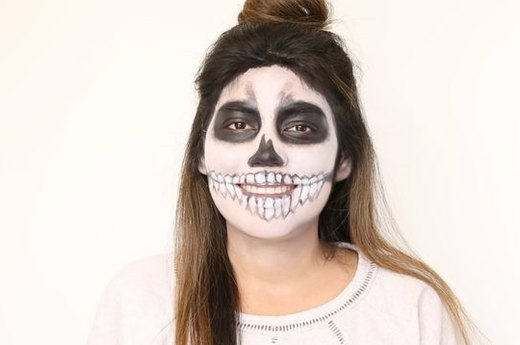 Pair this skeleton makeup with an all-black ensemble for a classic look that won't hinder your fun. Your guests won't even recognize you, and on Halloween, that's a good thing!